Thank you for joining us for another year of faith formation. We are looking forward to another year of faith sharing, fun, and friendship! 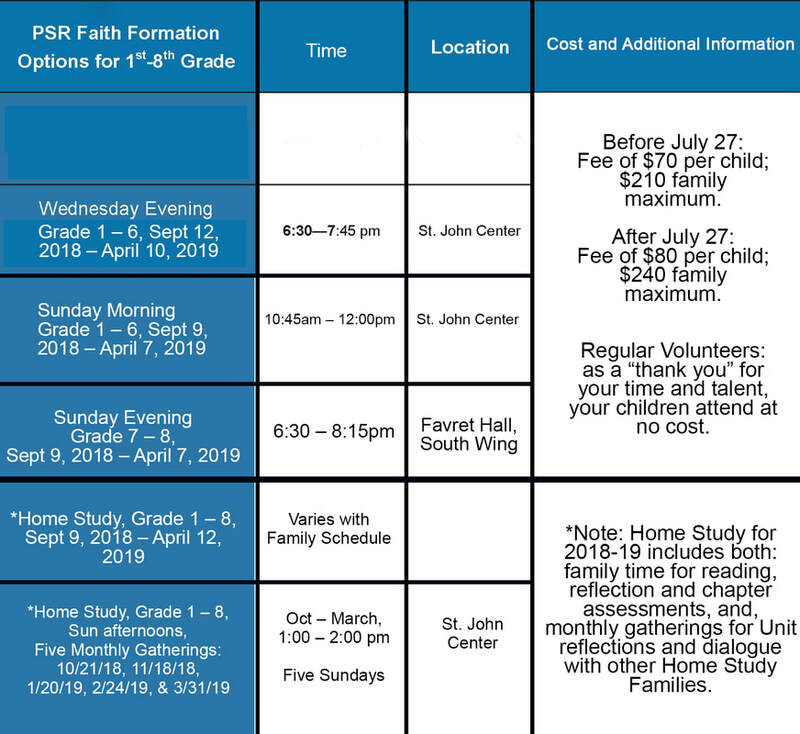 As you fill out the registration form please remember that any child who is new to the program and was baptized at a church other than St. John, must bring a copy of their baptismal record to the parish office. Please know that changes to your registration may be made any time before August 13, 2018. 1. I, the lawful parent or guardian of the child being enrolled on this form, give permission for my child to participate in the activity described on the Activity Information form and release from all liability and indemnify the Archbishop of Cincinnati (“the Archbishop”), both individually and as trustee for the Archdiocese of Cincinnati and all parishes and schools within the Archdiocese (the “Archdiocese”), and their officers, agents, representatives, volunteers, and employees from any and all liability, claims, judgments, cost and expenses, including attorneys’ fees, arising out of any injury or illness incurred by my child while participating in or traveling to or from the activity and further agree not to bring or prosecute or allow to be brought or prosecuted (including but not limited to prosecution through subrogation) in my name, or on behalf of my Child, any claims, lawsuits or actions against the Archbishop, the Archdiocese, and their officers, agents, representatives, volunteers and employees. 2. I further understand that my Child’s participation is purely voluntary and is a privilege and not a right, and that my Child, and I on behalf of my Child, elect to participate in spite of the risks. 3. I agree to instruct my child to cooperate with the Archbishop or his agents in charge of the activity. 5. This power of attorney shall lapse automatically upon completion of the activity and related travel. 7. This acknowledgement and release is intended to be as broad and inclusive as permitted by the law of the State of Ohio, and if any portion hereof is declared invalid, it is agreed that the balance shall, notwithstanding, continue in full legal force and effect. This acknowledgement and release shall be construed in accordance with the laws of the State of Ohio, except for the choice of law provisions thereof. *If you volunteer for any of these opportunities all children in the program Pre-K through 8th grade will be free! ​Generations of Faith! Held two times per year for community and service, these parish/family gatherings will occur on Tues & Wed, Oct 16 & 17, 2018, 6:00 – 8:00pm AND, Tues & Wed, May 7 & 8, 2019, 6:00 – 8:00pm. Participation in Generations of Faith is required for all PSR families, whether class room study or home study. Please be sure to pay the fee (per child) by mailing it (for the Early Bird fee, envelope must be postmarked by July 27), dropping it in the collection basket, or bringing it into the parish office by the deadline. ​*If you chose to pay online, please follow this link: https://stjohnwc.weshareonline.org/#. You can also find this link on the homepage (the "Donate or Make a Payment" button).